Delivering flawless short- to medium-range shots on an AR platform, the Sightmark Wolfhound 3x24 Prismatic Weapon Sight is ideal for a variety of challenging shooting situations including 3-gun competitions, hunting and law enforcement applications. 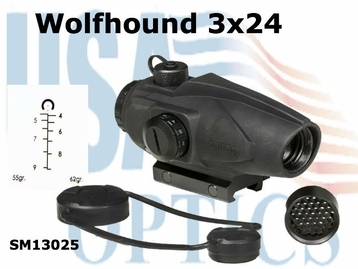 The Wolfhound 3x24 Sight is a military-inspired, fast-paced optical device featuring longer than average eye relief and an advanced horseshoe dot reticle that's ballistically matched to .223, 55 and 62 grain with holdovers from 300 to 900 yards. Its fixed power keeps the object in focus at 10 yards or more.